Don't forget gig tommorow in Kota Kinabalu, Sabah. Well as usual the normal place at Cowbor Bar, Asia City (just google map for the direction). It's Borneo Oi! Fest guys on 5th October. Presale tix for only RM25 and RM30 at the door. Check flyer below for details. While in Penang, there's another gig going on. It's sounds more brutal with gore grind kinda stuff. Thanks to DJ Echo from #TraxxFM for this flyer and info. He will be performing tommorow. The venue will be at Soundmaker Studio, Weld Quay, Georgetown and the tix price only RM12/head. 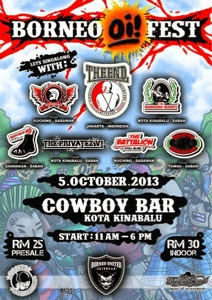 Featuring band such as Butcher Bastards, Keladak, Fukk Bar Kulture and many more. Check the flyer below for details.